During October–November 2008, salvage excavations were conducted at several sites in the vicinity of Yiftah’el Junction (Permit No. A-5271; map ref. 221573–3383/739478–40744). The excavations, undertaken on behalf of the Israel Antiquities Authority and underwritten by the Department of Public Works, were directed by E. Yannai (field photography). 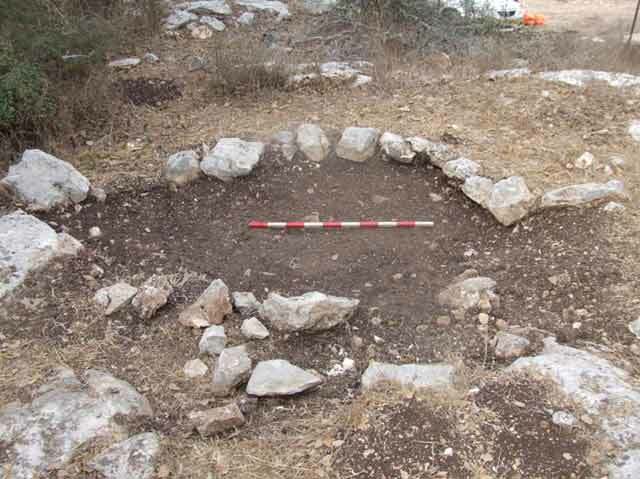 Four sites located in the region of the large archaeological site at Yiftah’el Junction were excavated. 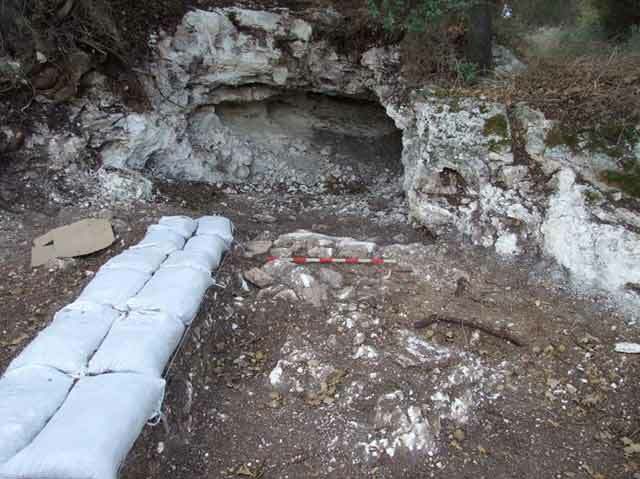 Ancient remains were exposed at two of the sites (9 and 15), while probe trenches dug with the aid of mechanical equipment at the other two sites revealed no ancient finds. Site 9 (map ref. 221785/739850). 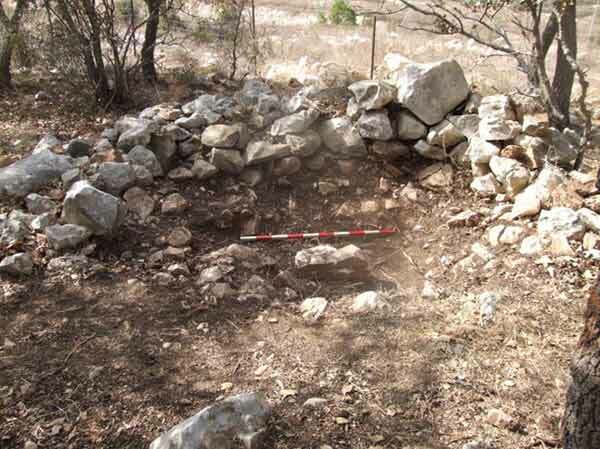 Six cairns were excavated along a gentle western slope of a hill, located c. 300 m north of Yiftah’el Junction. Each of the cairns had a circle or semicircle composed of two parallel rows of fieldstones (Figs. 1, 2). The semicircles were opened toward the east and the circles were slightly elevated along their western side. A shallow depression (depth 0.4–0.5 m) was discovered inside the circles and semicircles. A rifle cartridge that had been made in Italy and was stamped with the year 1942 was discovered in one of the circles. No other finds were found. The stone semicircles and circles were probably used as gun positions that overlooked the Nazareth–Shefar‘amroad, which ran past the foot of the hill. Based on the rifle cartridge, it seems that these were positions held by irregular soldiers, possibly those of the Qawuqji’s forces, who defended the road during the War of Independence to prevent an attack on Nazareth. Site 15 (map ref. 222308/740493). A natural cave that had been enlarged by quarrying was excavated on a steep western slope of a hill that overlooks the Yiftah’el site, c. 100 m to its east (Fig. 3). Two rows of fieldstones that had been placed alongside each other were discovered in the opening of the cave. These were apparently meant to support shrubs or branches that blocked the entrance. Silt and collapse from the rock ceiling had accumulated on the bottom of the cave. Several body fragments of jars, dating to the Hellenistic or the Early Roman periods, were discovered in the silt. It seems that the cave was used as a dwelling by shepherds or as a shelter for herds; the potsherds recovered from the silt were probably swept over from a site located higher up the hill. The large site at Yiftah’el Junction was inhabited from the fifth millennium BCE until the fourth century CE. No small sites were found on the hills around it and it is possible that these were either washed away or have not yet been discovered. The dense oak forests that cover the site and its vicinity were used for grazing and the natural caves nearby were adapted by quarrying for use as shelters for the shepherds and their flocks. 2. A semicircle of stones. 3. A cave and row of stones in its opening.